TREASURES OF TODAY the spectacular exhibition of silver masterpieces from the renowned private collection at Goldsmiths’ Hall, London moves to the first international venue on its travelling programme, the National Museum of Ireland in Dublin. As one of the United Kingdom’s leading patrons of modern silver design, the Goldsmiths’ Company has, during the 20th and 21st century, acquired an inspirational collection of innovative and well-crafted silver commissioned or purchased from individual craftsmen. The exhibition features 140 selected examples from the Company’s collection all of them among the most exciting and innovative silver creations to have been designed and made in Britain since 1980. A total of 58 silversmiths are represented – of which 54 are still actively working in Britain today - an extraordinary number of creative craftspeople excelling in the discipline of the decorative art of silver. Each of the pieces on display in exhibition demonstrates originality of design, combined with excellent craftsmanship and reflect the new and exciting directions which the individual silversmiths have taken over the past two and a half decades. Rosemary Ransome Wallis, Curator of the Goldsmiths’ Company’s Collections explains: “Innovative work in silver today explores broad concepts, for example the meaning of a vessel is redefined in how it is used, valued and aesthetically judged. In addition by using a wide palette of skills, from traditional techniques of raising, scoring, piercing and chasing combined with the latest advances in technology such as electroforming, TIG welding and computer aided design for rapid prototyping contemporary silversmiths are able to express their individual artistic persona in new and exciting directions by taking the material of silver beyond its historical boundaries. “A recent change in hallmarking regulations has also seen many silversmiths combining non-precious metals materials with silver to create objects which still retain a function but are merging into a sculptural discipline. Modern silver today can truly be described as a decorative art”. 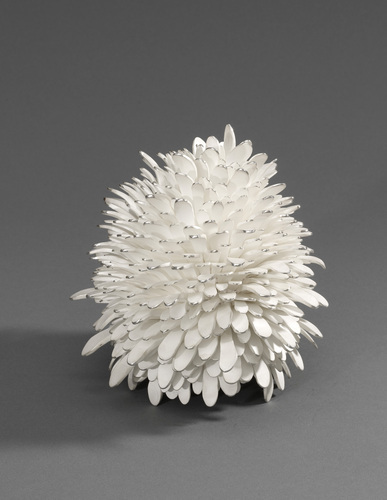 Among the new conceptual silversmiths featured in the exhibition are Hiroshi Suzuki, Angela Cork, Ane Christensen, Chris Knight, Junko Mori, Theresa Nguyen, Pamela Rawnsley, Linda Robertson, Michael Rowe, Rebecca de Quin and Simone ten Hompel. Their work is dynamic and often challenging. Pamela Rawnsley’s Three Day Vessels sequence 2007, are grouped to express both the passing of time and a sense of timelessness, while Simone ten Hompel intellectually empathises with silver and the form that it will take to create subtle nuances in vessels and other pieces such as her Aphrodite dish, 2004 a raised and unpolished silver dish set with a faceted Indian sapphire thus making it neither vessel nor jewellery but nonetheless a work of great beauty. Beauty is contradicted with stark forms in the two vases “Blackwell Series” 2008 by Rebecca de Quin evoking nature reclaiming abandoned natural sites. Chris Knight and his wife Maria Hanson’s drinking set, 2008, dramatically combines silver with anodised blue aluminium to great effect. Here the concept of the ceremony of drinking from a vessel is further emphasised by the stark contrast of machine-made versus hand-made. At the other end of the spectrum are the silversmiths who work in the tradition of the arts and crafts movement while still embracing modern technology. Many revere and find inspiration from the creatures and landscape of the natural world. An exquisite wafer-box, one of the newest additions, will be making its debut appearance in Ireland is a good example. Made in silver by Chris Burr, the triangular shaped rounded surfaces are meticulously and sensitively enamelled by Ros Conway with decoration which recreates the beauty to be found alongside the riverbank of the River Deben in Suffolk. Rosemary Ransome Wallis describes the wafer box as a “tour de force of design and execution”. With colleges such as London’s Royal College of Art attracting the very best of overseas students from countries such as Japan, Korea and Denmark, many of who decide to remain in the country after graduating, Britain has become the epicentre of modern silver today and the Collection of contemporary silver from Goldsmiths’ Hall seeks to serve as its ambassador. Visitors to the exhibition Treasures of Today at the National Museum of Ireland will therefore have the opportunity to admire remarkable pieces, rarely seen in public as a collection, giving a greater understanding and appreciation of the work of contemporary designer and artist silversmiths working in Britain today. One of the largest collections of Irish silver in the world, this exhibition traces the development of the silversmith's craft from the early 17th century to the present day. It addresses the evolution of design and examines the mining, assaying, and crafting of this precious metal. It illustrates the various uses of silver - religious, domestic and ceremonial and by means of vignettes seeks to place the objects in their historical and economic context. This press release was distributed by ResponseSource Press Release Wire on behalf of The Goldsmiths Co. in the following categories: Entertainment & Arts, Leisure & Hobbies, Home & Garden, for more information visit https://pressreleasewire.responsesource.com/about.